Heidelberg, August 22, 2017 - Microbrush® presents various disposable applicators for the precise and economical use of dental liquids. All are flexible and designed to remain in the desired position without rebounding. Non-absorbent fibers hold the solution and allow for excellent release and accurate placement of material. The Microbrush® applicator is suitable for applying cement, bonding and etching agents, calcium hydroxide paste, sealants and Disclosing Solution. The fixed brush head prevents dripping and is suitable for cleaning. Seven colors are available for varying or multi-stage treatments, as well as different sizes from Regular (2 mm), to Fine (1,5 mm) and Superfine (1 mm). The Microbrush® X applicator is used for endodontic treatments, fissures and gluing of pins. It can be bent up to 90 degrees, has a thin, long tip and is thus suitable for very narrow spots. The flexible head has short, solid fibers for uniform and controlled application of the material. The TRU™ by Microbrush® applicator is available for particularly demanding tasks. Its 12 cm long handle provides maximum control. The tip can be bent in two places, which allows access to areas that would otherwise be difficult to reach. This useful tool is available in seven different sizes and colors, and in four strengths from Regular (2 mm) to Ultrafine (0,5 mm). The UltraBrush® bristle brush applicator is ideal for applying desensitizing agents, whitening agents, fluoride, fissure sealing, and for large amounts of liquid. Its chemical-resistant fibers are able to withstand even aggressive dental substances. It is offered in two sizes: UltraBrush® Regular Size with 200 fibers for spreading thicker material, and UltraBrush® Fine Size with 100 fibers for more precise application. The Micro-Stix™ applicator has an adhesive point on its head. It is therefore ideal for lifting and navigating veneers, crowns, brackets and inlays. It is removed with a slight twisting motion. The applicator’s tip retains its adhesive effect, so the applicator can be used multiple times for one patient. 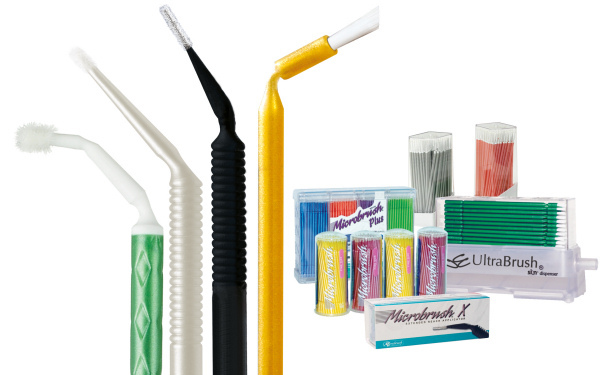 All Microbrush® applicators are available in convenient dispensers for hygienic removal or in refill cartridges. Microbrush® is a trademark of Young Innovations, a leading developer, manufacturer and distributor of high-quality dental products. The portfolio includes innovative solutions for prophylaxis, diagnostics, restoration, periodontology, implantology, endodontics and orthodontics and world-renowned brands like Young, Zooby®, Microbrush® and American Eagle Instruments®. The American corporation has its headquarters in Chicago and its European centre in Heidelberg, Germany. The enterprise was founded in 1900 and is owned by The Jordan Company.